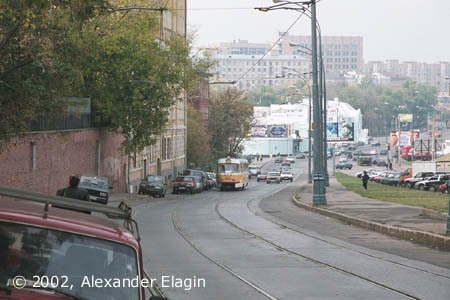 Gilyarovsky Street stretches along Prospekt Mira from Sadovoe Koltso (Garden Ring) to Rizhskiy railway terminal. A tramline in this street was constructed in 1935, when many tramlines were moved from main streets to parallel lazy ones. That had been a reasonable approach, but decades later it became forgotten. A beautiful church of St. Philip was built by a famous Russian architect Kazakov in 1777-1788. 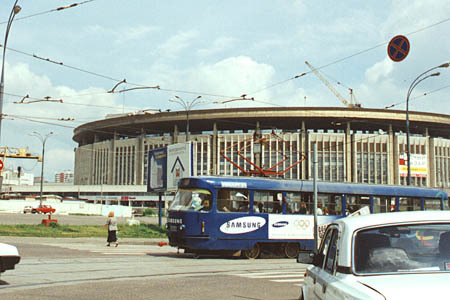 It is located in the centre of a large square cleared during the construction of the Olympic stadium in 1978. 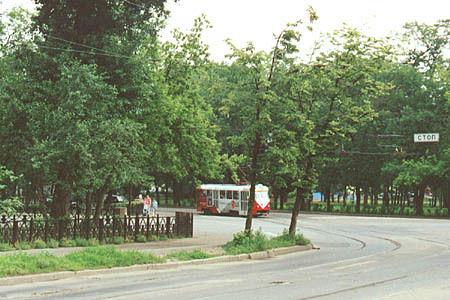 The tramline diverges at the church: one branch goes south towards Durov Street, while another goes north to Rizhskiy railway terminal; tram operation on it was ceased in 1995. But a decade before the situation had been quite different: this train just turns from that currently unpassable line. Tatra T-3 on route 7 climbs the slope of Durov Street. 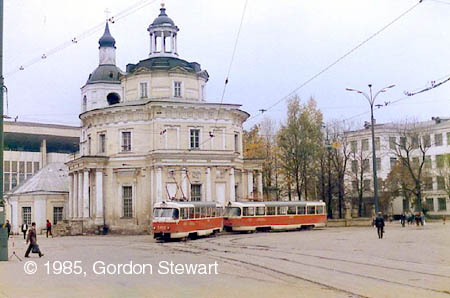 This line is a rather ancient one, being a part of the first stage of electric tramway construction in Moscow. The first trams came here in 1904. The Olympic stadium occupies vast space in this historical Moscow district. Until 1976, when its construction began, here was a village-like district of old Moscow with wooden houses and dove-cotes. It is doubtful whether such a great stadium had to be built almost in the city centre. A boulevard of Samotechnaya Street. 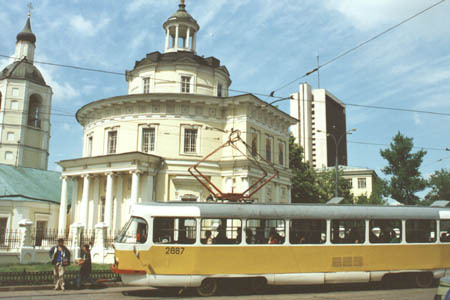 The tramcar goes towards 3rd Samotechniy Pereulok. Decades ago, there was a great junction of five streets with tramlines in this crossroad, but three of them are long gone.